Pop in here if you are interested in seeing some of the things I ran across which I deemed interesting or note worthy. The last couple of posts I made were of CARtooons ( ’79 Toyota & ’57 Chevy ) where I made reference to the CARtoons magazine and George Trosley. So, I started thinking maybe I should get into it and (in my best southern accent) “let them young’uns know whut’s whut“. I won’t go into the technical aspects of CARtoons magazine as you can find plenty of info in that regard from the external links I provided above. Instead I will tell you more about what it was for me. So this is more a rediscovery than a discovery. For me, CARtoons magazine was the ultimate world of imagination. I got into the magazine, stories and artwork in the 80’s. Being that I just got a driver’s license and my own car (a 1975 Oldsmobile Cutlass Supreme… lovingly referred to as the Tank) and I loved to draw. It was magic. Seeing the things people, or Krass & Bernie, would do to cars, trucks, vans (or whatever they got their hands on) provoked me to get into the workings “under the hood“. It was a whole new world of creation and exploration. The amount of knowledge and understanding of mechanical devices I gained during that part of my life is / was priceless… in my opinion. Anyway, since I recently got back into drawing my own CARtoons I became a bit nostalgic and collected some magazine covers to share with you all (plus this super cool FREE Facebook cover image!). As with most people that used to read CARtoons magazine… I wish I still had my old issues. 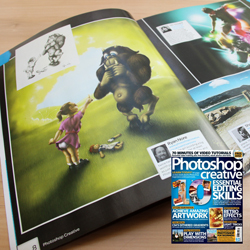 Photoshop Creative magazine, issue 92, was published this month featuring my “Bad Monster” illustration in the Reader’s Gallery on page 8. No, seriously, I was excited! I prepared all the files, sent the copy release, and asked when it would be published and where I could purchase additional copies… and nothing. No Joke. I checked issue 90, waited for issue 91, and then I wrote… they replied and said it would be in the next month’s issue… and there it was. It was difficult to not share the news when I heard and actually wait for the magazine to come out… but I did it! Anyway, it’s cool! Well, I must say, this has been a rather monumental day for me! 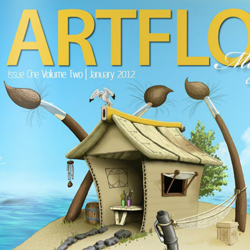 Today Artflow Magazine published its first anniversary issue. 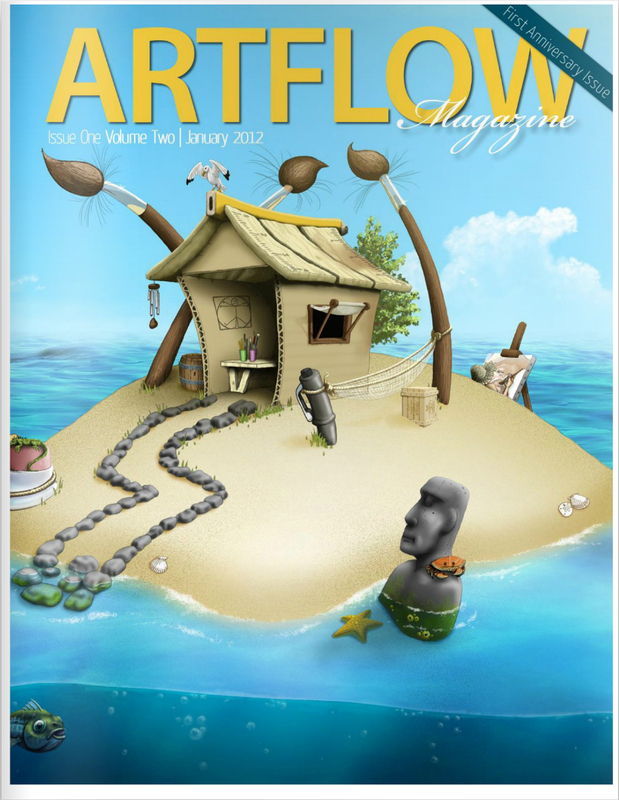 It not only contained an interview with me about myself and my art but my “World of Art” painting was the cover image!! How spectacular is that!? I certainly already knew that my interview would be in the anniversary issue but looking back I don’t think I gave it a larger value. I definitely am not implying that I did not consider it an honor and a privileged to be having the interview and for it to be published in the magazine. But when Flora emailed me to let me know the magazine had been published , where to see it, and that there was a bit of a surprise… well, it all hit me right in the face! 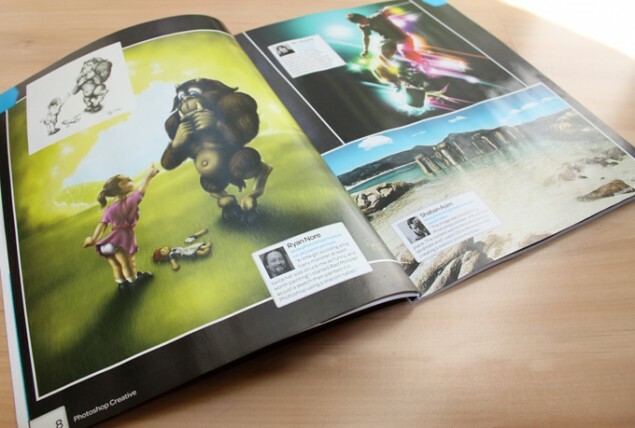 I mean the anniversary issues are marks of achievement for magazines… and my painting was the cover image!! That is just too cool! Anyway, “stoked” is an understatement. But! Now it is time to focus and keep my head! I definitely don’t want to become one of those artists that have a bit of success with a painting or two and then spend the rest of their time doing variations upon a theme in attempt to achieve the same “high” or mark of success. I have thoughts and things to say that push in another direction than that of “World of Art”.